"I know what a difference orthodontic treatment made for me. I want you or your child to experience the difference a beautiful smile and a healthy, functional bite can make for the rest of your life." At Montgomery Orthodontics, we insist on providing the right treatment, at the right time. This means that we work with you to create a customized orthodontic treatment plan, based on your individual needs. 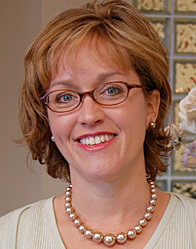 Dr. Nancy Montgomery’s passion for orthodontics comes from her own experiences. In fourth grade, she had a palate expander; then, during her junior year of high school, she underwent comprehensive orthodontic treatment in combination with jaw surgery to straighten her teeth and correct her bite. Please use this site to learn more about the different types of braces and appliances, including Invisalign® clear aligners. When you’re ready to schedule an appointment with Dr. Montgomery, please contact our Reynoldsburg office or our Westerville office. We look forward to meeting you! At Montgomery Orthodontics, Dr. Nancy Montgomery and our team work hard to treat our patients the same way we would like to be treated: with respect, professionalism, and sensitivity toward our needs. We understand the expectations of the patients and families we serve, and we do everything we can to make sure that each patient has an exceptional experience at our practice. Learn More.